DEAD PURGE: OUTBREAK IS A ZOMBIE ITSELF: SLOW-MOVING, MINDLESS, COLLAPSING READILY AND OFTEN. 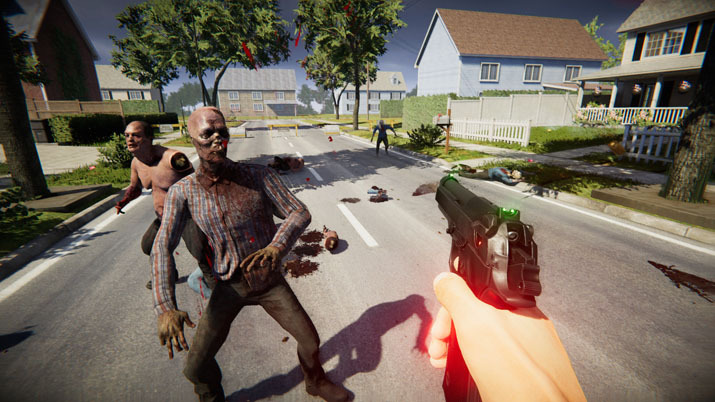 The objective of Dead Purge: Outbreak is simple: survive by killing zombies. You can accomplish this objective through either Horde or Survive mode. With Horde, “you fight against increasingly difficult waves of zombies”. In Survive, “you survive as long as you can in an endless battle.” Both modes produced a similar type of engagement, the only seeming difference is that in Horde, you purchase weapons instead of looting them from dead zombies [EN: Killing Floor, anyone? Lookin’ at you, @Butters], and in Survive, there’s never a break in the action to remind yourself that you’re still playing Dead Purge: Outbreak, nor is there a chance to reflect on your time slipping, carelessly and ceaselessly, into the void. Outside of the game modes, there’s a Research tab that allows you to spend “RP” (I’m assuming “Rank Points”) [EN: I’m assuming “Research Points”] to purchase stat buffs for your character and weapons – pleasantly, and surprisingly, this activity was void of microtransactions. Beyond these three features, there isn’t much else going on. 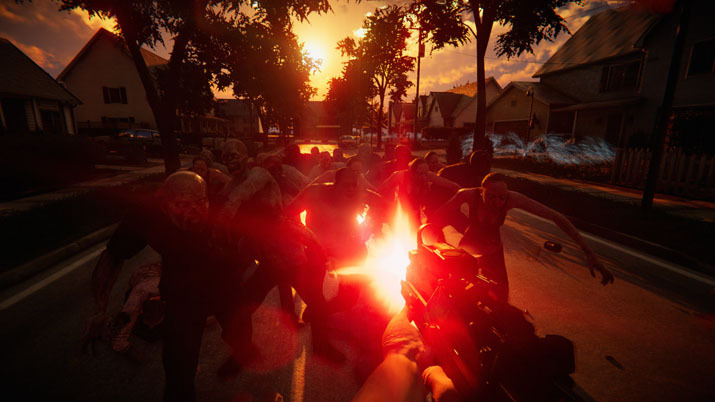 Dead Purge: Outbreak’s intended audience seems to be folks who are looking to shoot a whole lot of zombies with a whole lot of guns. The zombies are the slow-moving variety, with two types: walking, and crawling. Sometimes, a walking zombie turns into a crawling zombie after you’ve shot it a couple times. They can be easily avoided and, on a regular basis, you can line them up in narrow passages and dispose of them quickly and methodically. Sometimes, a single headshot suffices; when a zombie dies, though, it spurts out blood in a way that is neither satisfying nor exciting. The guns are garden variety: you spawn with a pistol, an Uzi, a knife, and a grenade. The pistol is pretty much useless as it doesn’t seem to do much damage; the Uzi, when fired, sounds like a tin can being dragged across a wooden fence, and there doesn’t seem to be a reason to have a knife. The grenade, on the other hand, seems to work pretty well. The shotgun, at close range, didn’t seem to one-shot any of the zombies and has only five rounds in the chamber. There is also a silenced pistol that does a lot more damage than an un-silenced pistol, as well as other weapons too expensive to purchase. When you kill a certain number of zombies in a row, a special, slow-motion/bullet-time event activates. Cool at first, but when combined with character movement that can only be described as “gelatinous,” the event becomes increasingly tiresome. There are three maps from which to choose, two of which feature variable times of the day. All the maps are pretty small and not particularly well laid out but, graphically, they look pretty good. It could be my monitor, but it seemed like the shadows were particularly dark and it was pretty difficult to see crawling zombies in certain situations. That’s a plus-or-minus, depending on whom you ask, I suppose. The music in Dead Purge: Outbreak is generic and appropriate. The zombies sound like they are constantly choking on a piece of fatty tuna. When you run low on health, a heart-beat sound begins to play and, on headphones, gave me more anxiety than any encounter with the undead. There were quite a few bugs I experienced during my play-through. Before the game begins, a little cinematic swooping shot of the arena is shown. Often, the game would false start in the first-person field of view before showing the cinematic. In some areas of the arena, I could see the zombies spawn from out of thin air – which could be a bug or… not. During my final match, when I tried to quit, the game seemed to think I was playing with a controller, rendering the mouse was unusable. After that, I was shown a black screen for an eternity until I manually closed the game. Dead Purge: Outbreak is not fun or innovative, borrowing too heavily from many superior titles; lacking distinguishing features and coming short in those provided is not a recipe for hours of mindless fun.